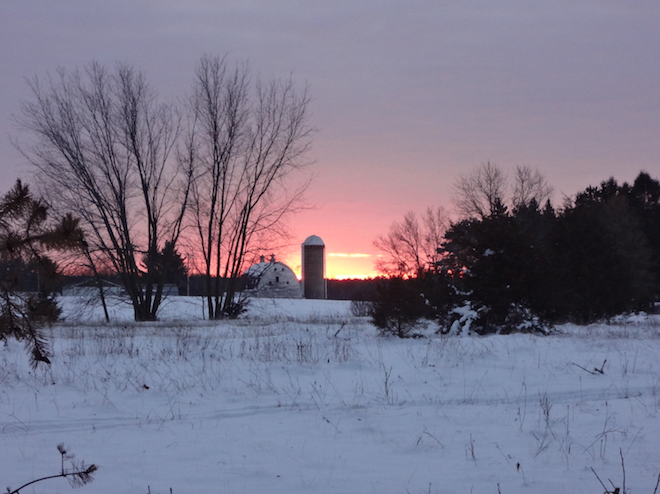 Flying over snow covered trails, seeing wild life on big open fields and feeling the wind blow through your hair. 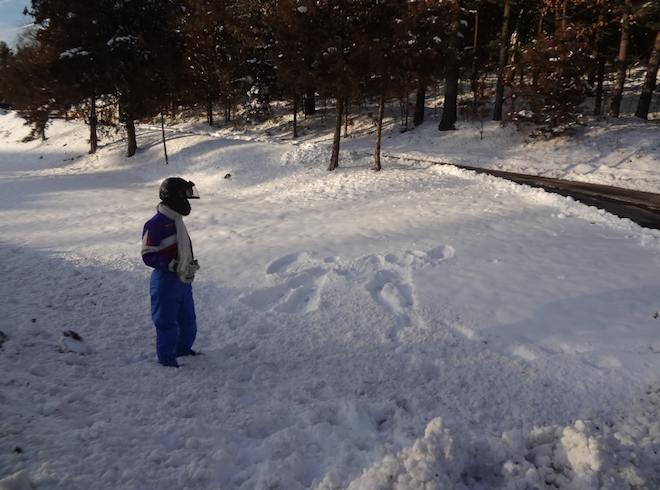 That sums up my first snowmobiling experience in a nutshell. Like every year my boyfriend Chris and I flew to the states this Christmas to spend the holidays with his family. 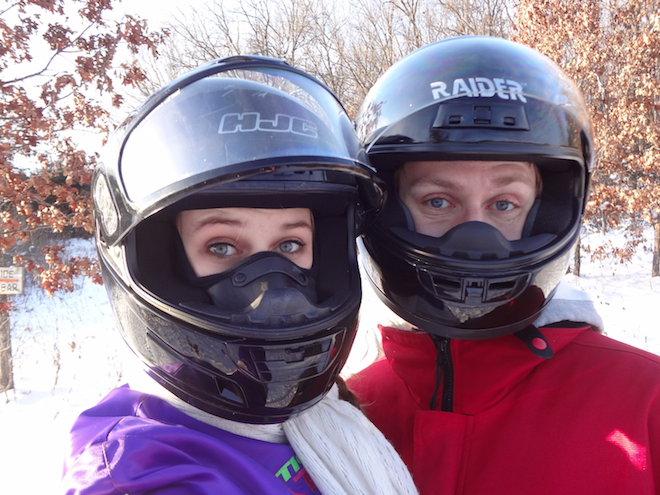 This year there was no snow in Wisconsin, which is very unusual, but also meant that we couldn’t go snowmobiling. 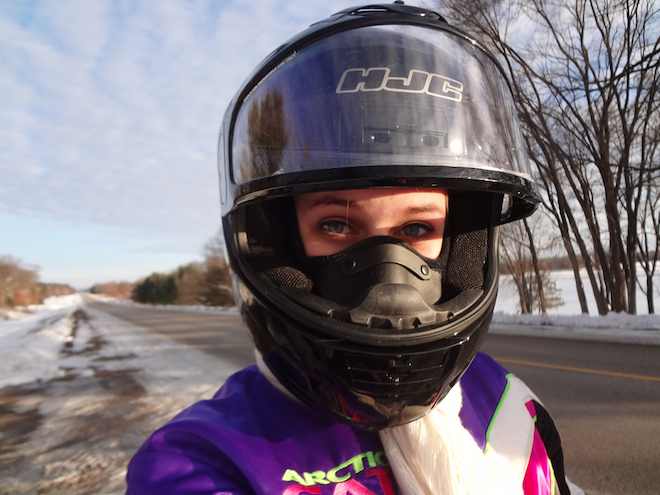 In this post I want to take you along on one of our previous snowmobile trips and show you why it is one of my favorite winter activities. Chris’ dad owns an amazing cabin around Wisconsin Dells, which is a beautiful nature area and at the same time a water park town. 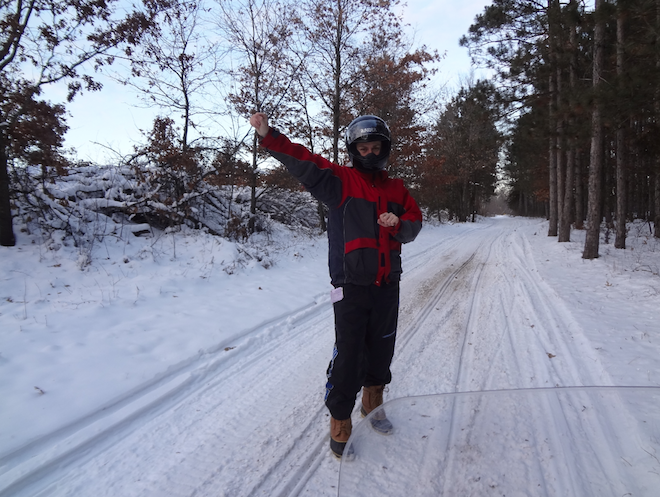 During the winter the best way to explore the surrounding woods is by snowmobile. His dad owns two older snowmobiles. Chris and his dad worked many hours on repairing them so that we could take them for a ride. In the States they make special trails to go snowmobiling on that go right through peoples property (they grant permission for this), quite amazing right? After going with just the two of us, we also took a ride with my boyfriends parents. The second time around we saw so much wildlife: deer, geese and wild turkey! Unfortunately every time I tried to approach them (I can hear you Americans thinking: silly European…) they ran away. 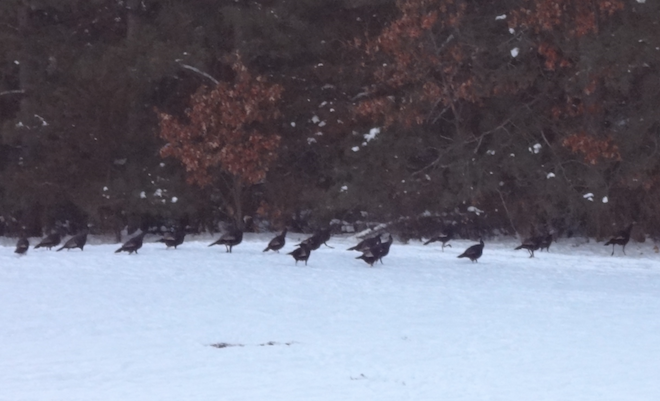 I did manage to get one good picture of the wild turkeys! 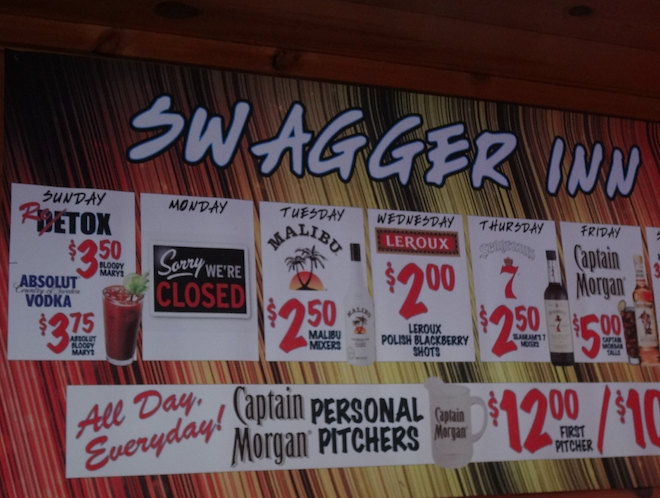 After riding for several hours through the middle of nowhere we stopped this typical American bar called ‘Swagger Inn’ to get some food. Remote places like this is where you get to experience life as a local. After eating a big burger with fries we discovered the trails were closed due to lack of snowfall. At that point we still had a two hour drive back home, I was pretty scared a police officer would pull us over (we got pulled over in the car this one time and it was very intimidating compared to what I’m used to in The Netherlands) as some trails go along side the normal road. Luckily we made it back to the cabin without running into the police. In The Netherlands mayonnaise is the main sauce to eat with fries. In America they all eat ketchup. Having mayonnaise with your fries is considered quite strange there. 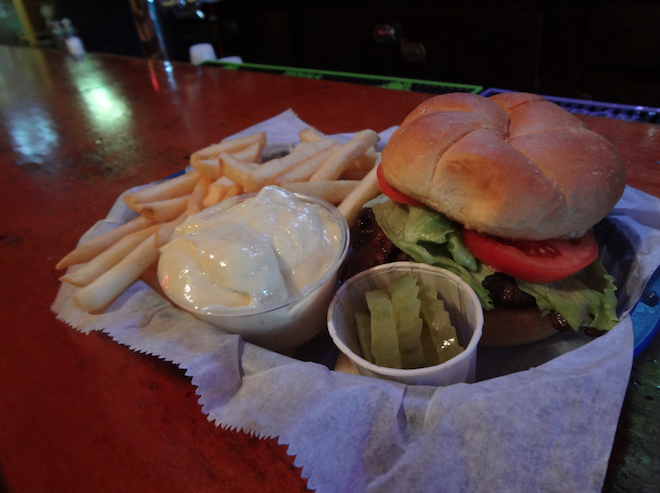 I was happy that they do have mayonnaise in the States most of the time (they use it on sandwiches for example), so I just requested a little bit of mayonnaise on the side every time I ordered fries (yay for awesome American customer service!). Some waitresses did look at me funny though whenever I made my request. For those of you that aren’t so lucky to have an American boyfriend who’s dad owns a pair of snowmobiles: you can rent them. You don’t need a license to drive, but I believe that wearing a helmet is mandatory. Which is kind of funny, because it’s allowed to drive a motorcycle without one! Hope you liked this post! If you did please follow me on Bloglovin’, Instagram, Twitter or Facebook. Wow mooie foto’s super leuk! Wat lijkt me dit gaaf zeg!